U19 Ukrainian League. 28th round. May 15. Schaslyve. Knyazha Arena. 17 oC. 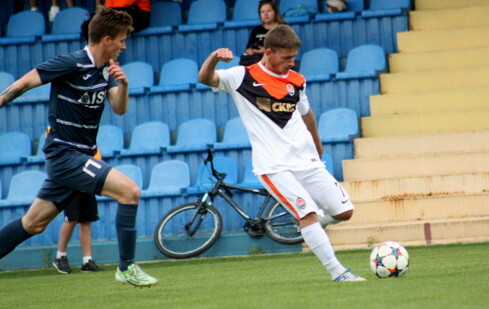 In the 28th round, Shakhtar entertained Stal. The Pitmen compete for the U19 League medals, while Dniprodzerzhynsk, who were topping the table at the start of the season, gradually lost the advantage, currently sitting in the fifth spot with 49 points. Let us remind you that in the first round match between the rivals, the team of Serhiy Kovalyov claimed a narrow win (0-1). Also, it is worth noting that during the winter break, a graduate of Metalurh Donetsk Vladyslav Savin joined the ranks of Shakhtar, appearing in the starting line-up for the game. However, there was no fully-fledged encounter between Savin and his former team: as early as on 10 minutes, the defender had to leace the pitch due to injury, with Andriy Zaporoshchenko taking his place on the wing. A few minutes later, Shakhtar took the lead. A move in midfield resulted in the assist by Vladyslav Bugai to Oleksandr Glagola, who struck from behind a defender diagonally into the far bottom corner to make it 1-0. The charges of Serhiy Kovalyov tried not to lose the initiative and could extend the lead, but Topalov’s runs lacked finishing, with the attempts by Avagimyan and Pikhalyonok being denied by opposition defenders. Danylo Ihnatenko has a most realistic chance after finding himself one-on-one with Ryabenko, though failed to beat the goalkeeper. The Diprodzerzhynsk side meanwhile, seizing the opportunity, capitalised on their only chance: on 38 minutes, Mykhailo Meskhi succeeded to send home a long-ranger, with the ball hitting the top corner to make it 1-1. Immediately after the break, the visitors went in front, with the defender Artur Danielyan getting himself on the scoresheet and making it 1-2. Donetsk managed to level it within ten minutes. Vladyslav Bugai received the ball from deep, bore down on goal and easily beat the keeper to make it 2-2. However, the Pitmen were not happy with the stalemate, they launched an all-out attack and missed the opposition counterattacking move, which was rounded off by Kyrylo Kostenko – 2-3. After that goal galore, Stal dropped deep and, even staying with ten men (on 70 minutes, Armen Ohanisyan got his second yellow card), successfully kept the score intact. Shakhtar failed combination wise, lacking individual lustre to create any clearcut chances. This fact notwithstanding, the Orange-Blacks still could score, with Prodanov and Senytskyi wasting their chances. 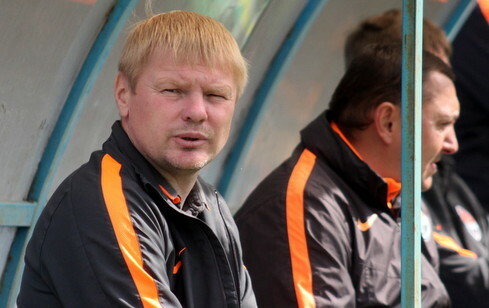 2-3 - Shakhtar lost to Stal, retaining the third spot in the table. This coming Wednesday, May 18, Serhiy Kovalyov’s side are to play the postponed match against Vorskla, and on May 22, the Pitmen will be receiving Skala Stryi in Schaslyve. - The team who want to fulfil the greatest goals, must be focused in every game, motivated, tuned to fight from the first until the last second. Today, unfortunately, this attitude was shown not by us, but by our opponents – Stal Dniprodzerzhynsk. For us, this match was more important standing wise, but the visitors proved their will to win and deservedly won. We constantly repeat it to the boys that every player must find motivation and strive for progress, being the only way to grow into a true professional. Those who understand it, will succeed in both football and life.